Judge Bill Wilson paused for a moment with all the division champions and their Angus in the arena. 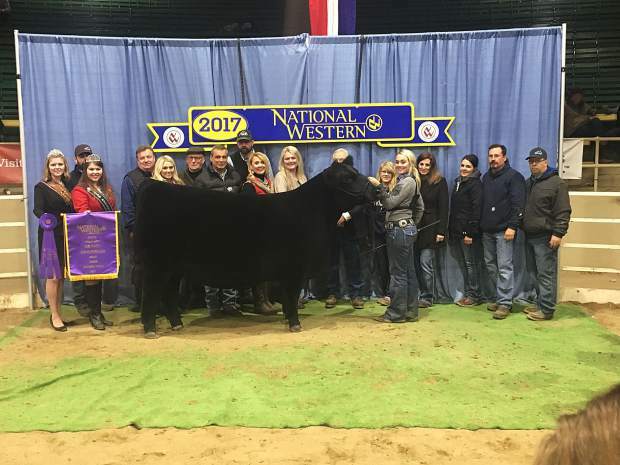 After judging and determining the best in each division, Wilson had one more look at the winners of the Junior Angus Heifer show at the National Western Stock Show. The show lasted all morning and went a few hours into the afternoon Jan. 12 in Denver, and at last Wilson pointed to Sydney Schnoor, the overall Junior Angus Champion. As soon as she was announced, her family and friends cheered, Schnoor, who is from Chowchilla, Calif., grinned and started to tear up. After the brief cheering concluded, Wilson signaled once more — this time to Evan Henning — to designate him the reserve. The top two winners gave one another a congratulatory hug over Schnoor’s heifer. The excitement and emotions were present, but it wasn’t the first time Schnoor earned the large purple banner. She won the Angus open show a year ago. This was her 10th year showing and attending the stock show, and she doesn’t take her success for granted. Right away she pointed to friends and family because they’re as much a reason for her victory as she was. 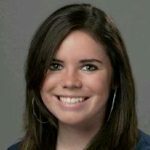 “I’m excited, obviously, and grateful for all the people I had to help,” she said. She likes showing Angus because it’s competitive. Any breed-specific show will be. But it was Angus she decided on. That’s the same reason why the reserve champion, 18-year-old Henning from Janesville, Wis., shows Angus as well. It wasn’t a question of whether it should be an Angus or a Hereford or a Limousin. “It’s just always been Angus,” he said. This was the third year he showed at National Western, but the first time performing as well as he did. Henning attends a number of shows across the country, and, like Schnoor, said there’s no way he could have showed, let along performed as well as he does if it wasn’t for his team. “If it wasn’t for (herd manager) Courtney Zehr and my parents, I wouldn’t be here,” Henning said. While it wasn’t necessarily a family connection that got Henning or Schnoor interested, others at the show did get into the breed because of someone in their family. Hailey Boyd, 14, of Waynesville, Ill., was the reserve champion in the senior calf division. The native of Heyworth, Ill., has shown Angus at National Western for four years. She’s the only one of her family who has shown them, but she fell in love with the breed because of her grandpa. “My grandpa (Jack Wilson) has raised them since he was a kid and got me on the breed,” she said. For the exhibitor who placed grand champion in Boyd’s division, Angus was a breed she fell into, but has no intention of changing.